Fancy winning yourself an ultra-rare piece of PES memorabilia? In order to celebrate the demo release with you, we are giving out to one lucky PES fan an exclusive one-of-a-kind signed T-Shirt of Cristiano Ronaldo! This T-shirt is an exclusive design made for PES by Nike and it is not available in stores which makes it a unique collector’s item. 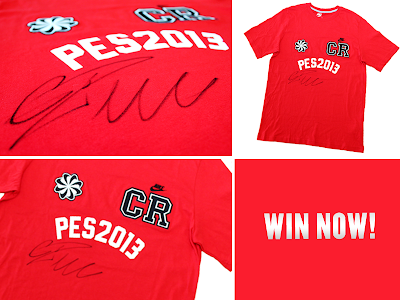 To have a chance of winning, all you have to do is sign up to receive the PES Team's newsletter. The competition ends next Friday so don't hang around if you want to win this fantastic prize.